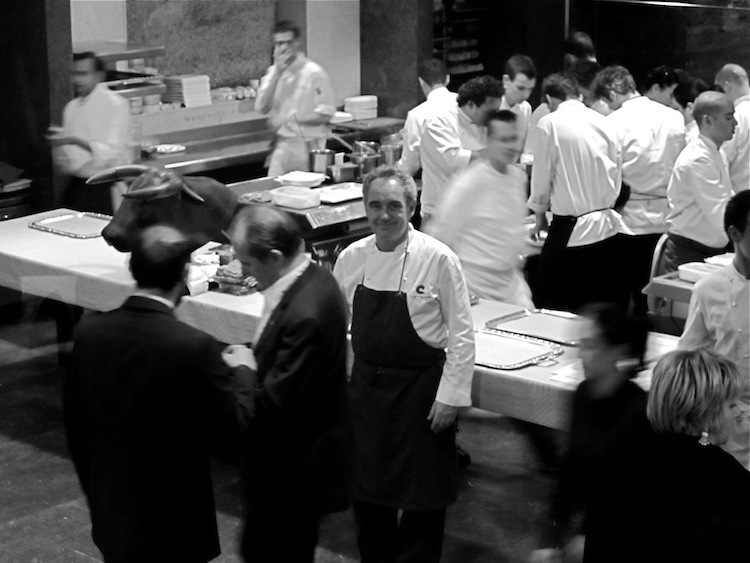 How Ferran Adria changed the world of cooking forever with his creativity. One day, Moy called Gines and said, “Please take your son back, because now this boy knows more than me.” Ferran had earned enough money to head to Ibiza, so he spent a month there, eventually needing more money and ending up back in the kitchen at a resort hotel called the Club Cala Llenya. He spent four months cooking, partying, and lying on the beach before he went back home. After his arrival there, he did brief culinary stages in multiple restaurants, a traditional-style place called El Suquet; a tapas bar inside Barcelona’s El Bingo gaming parlor; Castell Arnau, a conference and party venue in a fourteenth-century villa; a place called Martinica, back in town, where Ferran had what he calls his first contact with “modern cooking”; and finally, for two weeks, Finisterre, an elegant, old-style restaurant then considered to be among Barcelona’s best. In late September 1982, at the age of twenty, Ferran was drafted into Spain’s military and posted to the country’s Mediterranean naval base in Cartagena, Colombia. Ferran volunteered for culinary service and spent a month in the cafeteria, preparing massive quantities of simple food for the sailors. During his time in the barracks kitchen, he was scouted by Jorge Marin, the civilian mayordomo, or head butler, for the household of the base commander, Admiral Ángel Liberal Lucini. Lucini “liked good food,” and Marin was his talent scout. After a few culinary tests, such as making mayonnaise, paella, or vichyssoise, Ferran was ranked bien and asked to join the admiral’s kitchen. Although he thought it was a cushy posting, he quickly realized he not only had to think up new menus every day for the admiral’s family, but also to conceive and execute serious banquets for visiting dignitaries. It was here, alongside his close friend and future collaborator Fermí Puig, that Ferran began experimenting with new techniques. Fermi came armed with an arsenal of books on haute cuisine, and they used them to prepare meals for the admiral and his guests. They prepared everything from Salmon Terrine with Green Peppercorns and Rich Aspic to Loup en Croûte, legendary chef Paul Bocuse’s preparation of bass in a pastry shell. The work would eventually result in Ferran’s first book, El Sabor del Mediterráneo, a combination of the recipes used for the banquets and some “daydreams” Ferran never even prepared. When it came time for Ferran to take his summer leave from the navy, Fermí convinced him to do a stage at the restaurant he worked in prior to the military, elBulli. Ferran initially had no interest in spending his vacation in the kitchen. But the combination of two Michelin stars and a beautiful beach eventually got him to relent. Ferran traveled to Roses, Spain, and, as instructed, waited in a small bar called La Sirena. There, a waiter picked him up and drove him up a dirt road to the restaurant. He spent a month under Chef Jean Paul-Vinay, immersed in the world of haute cuisine. After three weeks, says Puig, “Juli (the general manager) called to say, ‘Hey, Fermí, no offense, but that guy you sent, Fernando, he’s much better than you.’” At the end of the month, Ferran headed back to Cartagena. At the end of 1983, Ferran finished his military service. He spent a few months working in Seville before reuniting with Fermí to begin work full time at elBulli. When Ferran joined the staff, Juli Soler, the manager, encouraged him to travel to expose himself to fresh ideas and cultures. Adrià toured some of France’s top kitchens, learning various techniques from culinary greats. He eventually took over as head chef, and at the beginning of 1987, he went to the Côte d’Azur. He stayed in the Negresco in Nice, whose restaurant, the Chantecler, was run by famed chef Jacques Maximin. He attended a culinary demonstration by Maximin and, during the discussion following the demonstration, the chef was asked what creativity was. Maximin replied, “Creativity means not copying.” This simple sentence was what brought about a change in Ferran’s cooking, the cutoff point between his “re-creation” of others’ dishes and a firm decision to become deeply involved in his own creativity. Upon returning to the restaurant, Ferran was convinced they needed to use cook books less and less and try to find an identity of our own. He gradually began to experiment with new techniques for preparing and presenting food, and by 1994, four years after becoming co-owner of the restaurant, he had moved away from classic approaches altogether. He replaced this with his own creation, “technique-concept cuisine,” which many today refer to as “molecular gastronomy,” in which he subjected potential ingredients to rigorous experimentation and scientific analysis as a means of creating novel dishes that produced unexpected sensations. The most famous example was his use of “spherification,” which delicately encapsulates liquids within spheres of gelatin, its best-known application is “liquid olives,” which resembled solid green olives but burst in the mouth with olive juice. Almost twenty years after arriving at elBulli and thousands of hours in professional kitchens, in 2002 the restaurant would be named the number one restaurant in the world and Ferran Adrià would be widely regarded as the best, if not the most creative, chef in existence. The restaurant would receive the honor five times before closing to become a center for studying creativity in 2011. Ferran is hailed as “the Salvador Dali of the kitchen,” and his work has been thoroughly documented in over 30 books, exhibited in museums, and copied, with both good and bad results, all over the globe. But Ferran’s unbelievable achievement didn’t come easy. He built his wave of success meticulously over decades, through a combination of patience, struggle, experimentation, self-awareness, building his team, and silent struggle in a remote restaurant with few customers and limited resources. Every success, every experiment, every hour of thought, every piece of advice, every decision he made compounded on the next to eventually create a self-sustaining energy, a wave, that over time carried him to a peak. Your pursuit is no different.